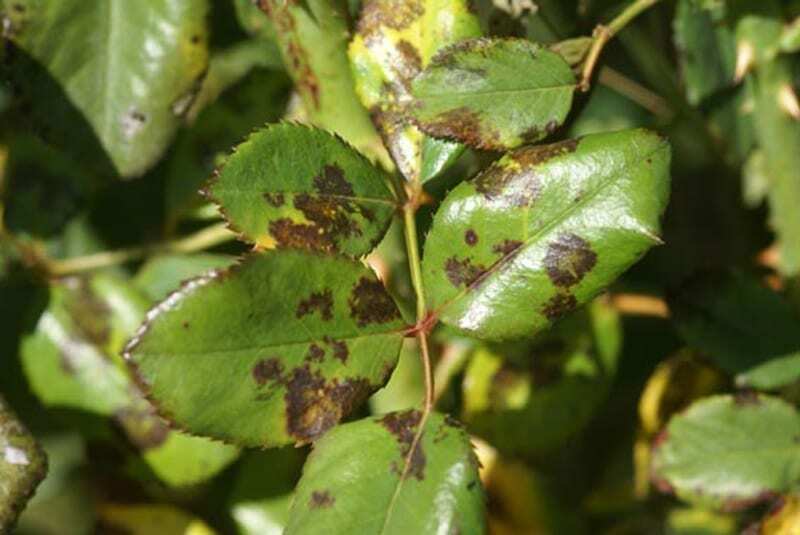 Black spot is one of the most common and important diseases of roses throughout the world.It is caused by the fungus Diplocarpon rosae. 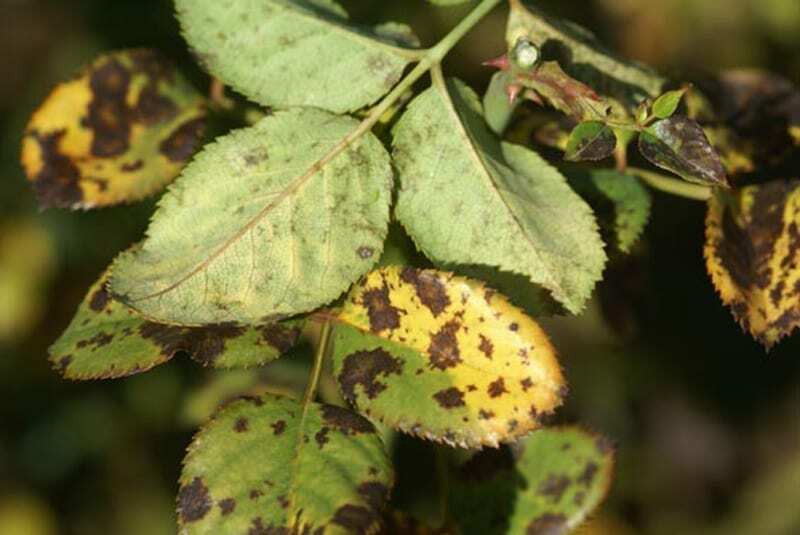 Black spot will cause a general weakening of the plant so that progressively fewer and fewer blooms are formed if the disease is left unchecked due to loss of foliage. 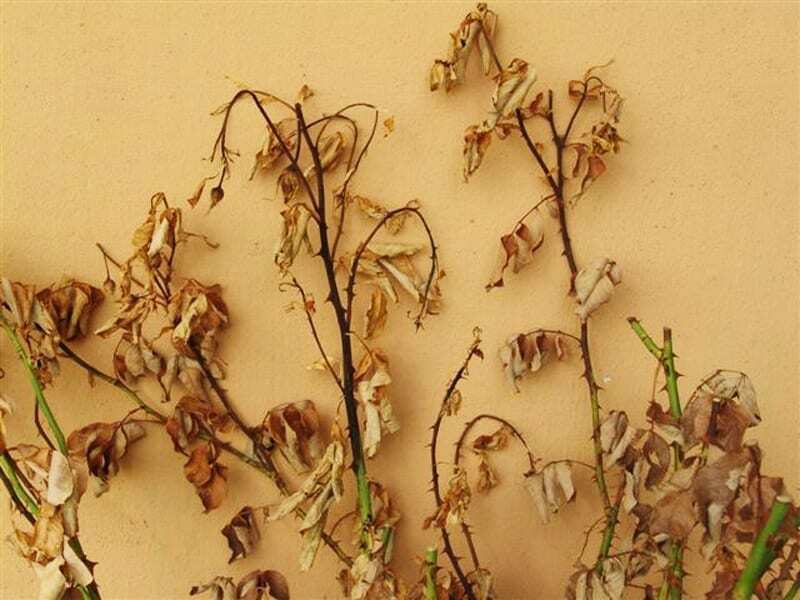 Plants so weakened are increasingly subject to winter injury and other diseases. surface. The spots can be up to 50mm in diameter and typically have fringed borders. 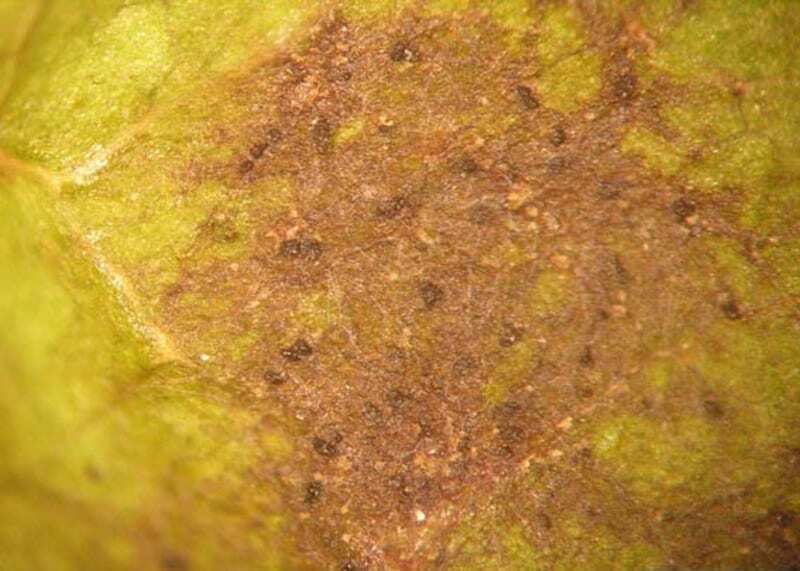 Yellowing of the leaf begins surrounding the spots (due to death of cells in an attempt to stop the fungus from spreading) and then entire leaf may yellow and eventually drop off. Close inspection of the spots will reveal the presence of tiny black spore producing bodies. The fungus may also infect the canes where lesions appear purple at first and later black. Black spot causes defoliation that occurs when the fungus is allowed spread uncontrollably. 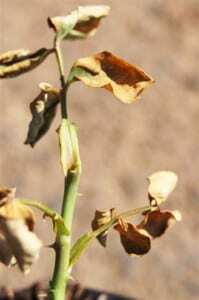 First symptoms will occur on the mature [leaves] at the base of the plant, gradually spreading to the top. The main function of plant foliage is to photosynthesise, creating nutrition for the plant for further growth. Indirect damage is caused by sun heating up the sap within the denuded stem up to boiling point which may lead to stemkanker. You will see weaker growth and reduced bloom in the season following severe black spot damage. must be wet for at least 7 hours before they can germinate. A temperature of 18°C is best for spore germination and the disease develops most rapidly at about 24°C. Temperatures of 30°C and above inhibit the spread of the disease. 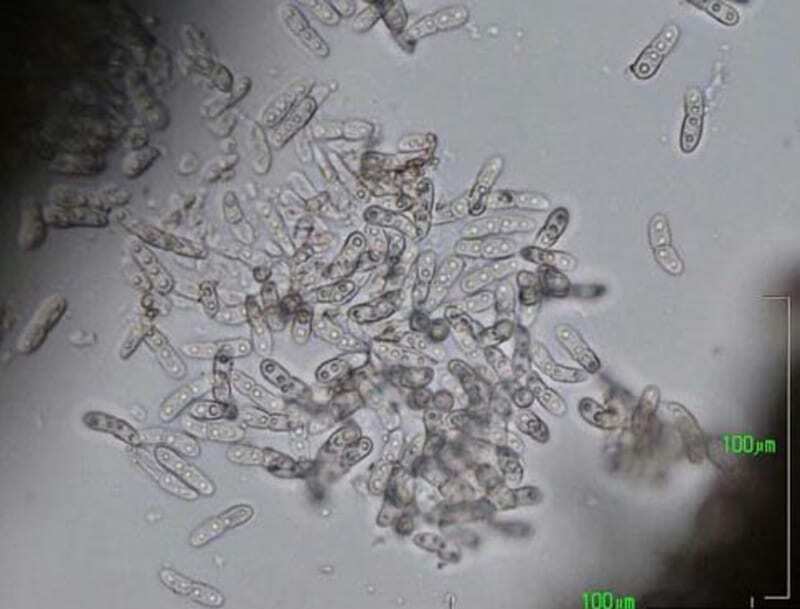 The spore producing structures (acervuli) form within two weeks of the initial infection. These structures release spores which are blown or splashed or otherwise carried to new tissues initiating new infections. The fungus survives the winter in fallen leaves and at infection sites on the canes. 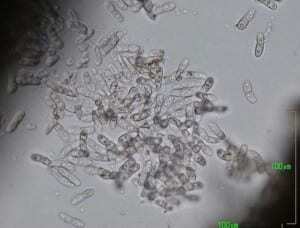 Spores will not survive in the soil and individual spores do not survive longer than one month. In spring, spores are splashed up onto newly emerging foliage during rains or irrigation. Once the weather begins to stay consistently warm and humid, the spores germinate and infect the plant within one day. Visible symptoms (black spot and some yellowing) will be evident within five days, and reproduction and spreading new spores within ten days. The new spores will infect other parts of the plant, or be carried on the wind to any other nearby rose bushes. Plant roses in full sun. They should receive a full six to eight hours of sun daily. Plants will grow more robustly and be able to resist black spot better. Shade causes slower moisture evaporation thus creating a breeding zones for black spot and other fungal diseases. Plant roses in an area with good air circulation and space them well. Moisture evaporates faster. In addition the breeze will dry off the foliage. Aerate the soil in winter. The roots of roses need an aerated soil; plants are stressed if water logging occurs and stunt new growth, thus being more susceptible to black spot. Water correctly. In autumn, avoid over-head irrigation during the late afternoons and evenings. Water evaporates much slower in cooler evening and nighttime temperatures. Avoid wetting the foliage especially during dark cloudy days. Choose resistant varieties. Roses vary in their resistance to this disease. Use resistant varieties for low maintenance plantings. The method of picking off diseased leaves to prevent spreading has become an old fashioned method due to the availability of new, disease tolerant roses and effective pesticides that should be used for major infestations. Spot checks and preventative spraying are essential. 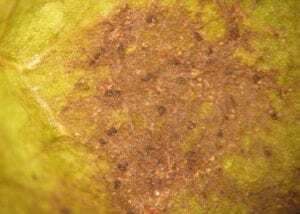 Effective fungicides should be on the shelf in regions where this disease is prevalent such as Coastal regions and on Inland regions if summer rains are prevalent. Protecting the leaves by spraying is effective. During ideal “black spot” weather condition, spraying on a bi-weekly basis is essential. The following fungicides are effective to a degree in preventing the spores to enter the leaves as well as killing spores on the leaves. The most common group contains the active ingredient Mancozeb. Of these are many fungicides registered under various trade names. 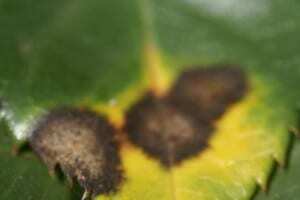 Several fungicides are registered for control of black spot. Because of the waxy nature of rose leaves, a spreader added to the spray will give better coverage. We strongly recommend ‘CHRONOS’, a suspension concentrate fungicide with the active ingredient: Prochloraz zinc complex (imidazole) & Prochloraz equivalent. The old remedy of treating black spot with a baking soda spray has been shown to be ineffective. When Using Pesticides always follow the instructions. See the different types of pests & diseases on roses and the control of them here. Regular fertilising roses during the growing season is essential, and plants react promptly to additional nutrition. However, fertilizer is not the solution to all ills – and two handfuls of fertiliser are not invariably better than one. Roses are often burned by having too much fertilizer placed in a heap next to the main stem or sprinkled in a narrow circle around it. Fertilizer is only of use when it is dissolved by water and carried to the roots, which are more or less confined to the space in the rose bed or hole in which they were planted. Good news! Ludwig’s Vigolonger cannot burn the roots. A multi-coated general fertiliser with a controlled release of balanced nutrients over 8 month. Sprinkle the 30g measure cup of Ludwig’s Vigorosa fertiliser or a handful of other Rose Fertiliser brands over each bush once a month or even every six weeks from August until about April. Very keen rosarians might prefer to fertilize lightly every week or every fortnight, in which case the handful is applied to three plants instead of one. In cold regions, apply fertilizer only until the end of February or early March. Sprinkle the fertiler around the plant and water well there after. 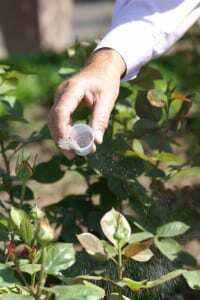 If you have over-fertilised your roses you should try to dilute the fertiliser to the subsoil. Water deeply 2 to 3 days in a row. Fertiliser burn has stopped. The eye of the upper leaf axle is sprouting again. Plants to the left have been fertilised. Plants to the right have been missed and are a much lighter, more yellow shade of green. Vigorosa consists of a desired balance of Nitrogen, Phosphorus, Potassium, Calcium, Epsom salt (Magnesium Sulphate) and humic acids. In order to appreciate VIGOROSA as a superior fertiliser, one needs to understand the action of HUMIC ACID. The roots of plants need to absorb nutrients in the soil in order for them to grow and produce food. Any organic matter, be it leaf litter, bark chips, pine needles, straw, hay, lucerne, saw dust, vegetables, needs to decay to compost – either in the soil, as mulch or in a heap. Before compost has any nutritious value it has to finally become Humus or more accurately, humic acids. Humic acids consist of complex macromolecules and represent a mixture of four main distinct components: Humic acid, fulvic acid, ulmic acid and humin. The benefits of humic acids include physical property changes, chemical changes and biological changes in the soil. Humic acids enhance fertilization. Humic acids provide a way of storing the various nutrients provided by chemical fertilizers (the so called ions of calcium, potassium, magnesium, nitrate nitrogen etc.) for absorption by the root system, rather than allowing them to travel to the water table below and be lost to the plant. On newly planted roses VIGOROSA should only be applied about a month after planting at half the 30 g measuring cup. Growing rose bushes should receive 30g of VIGOROSA monthly from August until April. Vigorosa is best sprinkled over the leaved bushes to achieve an even spread over the rooting zone. Fertiliser dust on the leaves to be brushed or watered off. Vigorosa needs not be dug into the soil. Water will dissolve it and carry it through the mulch to the roots. Adequate watering roses, ideally in combination with fertiliser, is important in determining the quality and extent of new growth. The quantity and intervals of watering depend not only on rainfall and on the soil type and thickness of the mulch, but also on temperature. Irrigate thoroughly once a week in moderate weather. Every day during very hot periods to cool down the plants as well as to compensate for the loss of moisture from evaporation. At all times, make sure that the irrigation period is sufficiently long for water to penetrate the mulch and soil and reach the roots. Unsatisfactory performance can often be attributed to lack of water, even when plants are watered every day. Water can be prevented from penetrating down to the roots if, for instance, there is too thick a layer of mulch; or if the plants are irrigated with too fine a spray and for too short a period for water to roll off the leaves and reach the roots. On slopes or embankments, it is essential to create a basin or place a half concrete ring on the lower side of the plants in order to hold sufficient water to penetrate down to the roots. Trees nearby may send their roots into the rose bedding and will take all water and suffocate the roses. The quality of the water can limit rose growing in some regions. 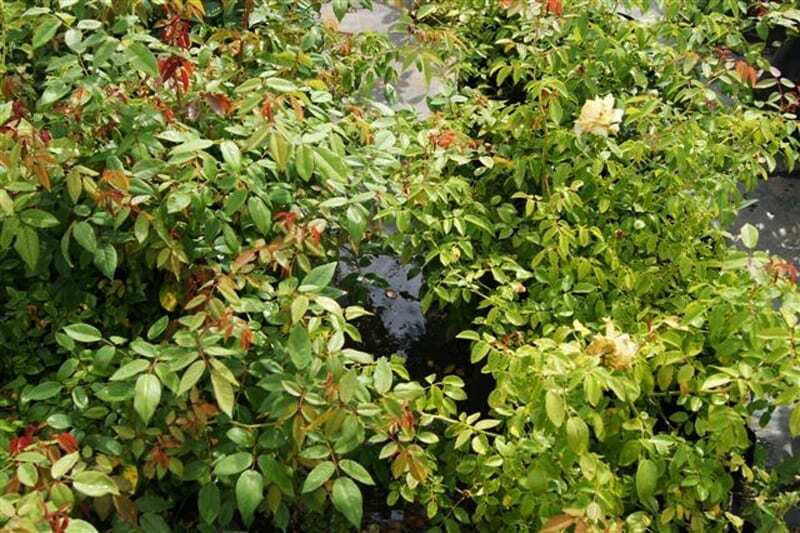 When irrigation water contains relatively high proportions of sodium combinations (known as brak water), the absorption of some micronutrients, such as iron, is blocked and the leaves manifest a light-green to yellow appearance. If the sodium in the soil is not flushed out occasionally by rain water, the situation compounds and the roses deteriorate further and may die. Overhead or subfoliage irrigation are both acceptable, although moisture from overhead irrigation can spoil open blooms. Watering should not take place late in the afternoon during autumn or on overcast days, as water standing on leaves for several hours causes germination and penetration of black spot spores. Rain is irrigation from heaven. It is nevertheless advisable to ensure that rain has indeed been sufficient to penetrate deeply (at least 15 mm), otherwise additional watering becomes necessary. An irrigation system is essential in a rose bed, if not for the whole garden. 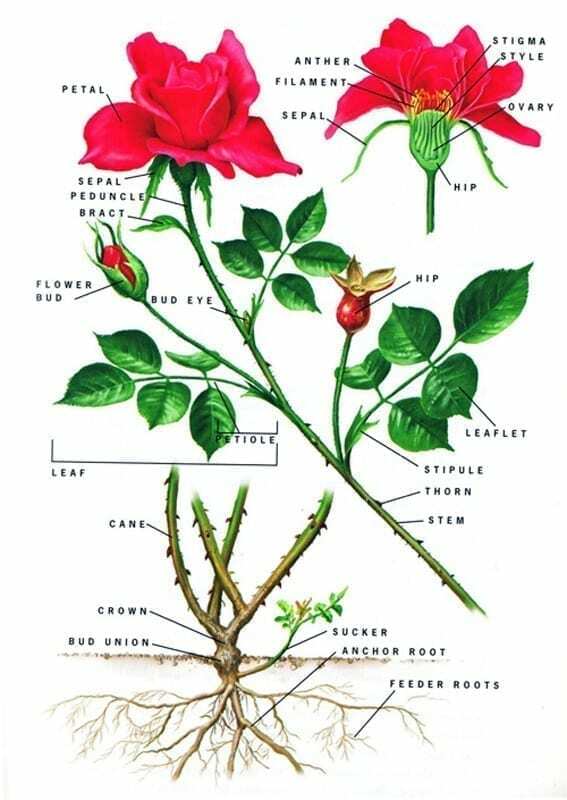 Be a rose expert and know your anatomy & botanical terminology.